Our value lies in our unique ability to blend different methods, models and collaboration techniques in the design of customised collaborative journeys. This often involves tapping into a toolbox of collaborative ‘modules’ that have repeatedly proven their robustness and effectiveness in diverse settings and across geographies and industries. Some of these standout for their universal relevance. After almost 20 years working with senior executives around the world on the design and execution of their boldest ambitions, we have learnt a lot about innovation and successful business transformations. We have brought those learnings together in the Parkour framework: an innovation engine that delivers transformation outcomes. The above Parkour website will give you an overview of why we think it is so critical to face the current wave of change and disruption, seize the opportunity it creates and transform organisations with speed and agility. The DesignShop™ is the flagship of our suite of services. It unfolds in a three-day collaborative workshop – supported by a four to ten week co-design process – to accelerate complex decisions that usually involve many stakeholders. Leveraging an experienced facilitation team, large-scale change model and creative workspace, we help propel clients through strategy and solution design into implementation within three days. With strategy, the challenge leaders face is to provide clarity and focus, keep a clear line of sight from vision to execution, and develop the flexibility to embrace the unexpected along the way. At wheretofromhere? 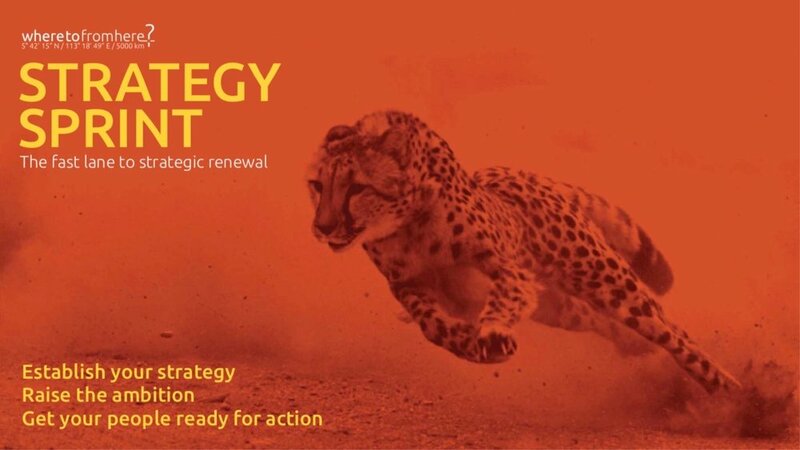 we have developed the Strategy Sprint framework to help our Executive clients do just that. Incremental innovation on processes, products and services is one thing, disruptive innovation on business model is another. And if you only have one certainty, is that you invent the future with the people that are running the business of today, and working in the same way. We have developed a 4-month process combining insights from open innovation, experience design, community building and social engineering. To surface, test and select new business models to incubate and eventually take to market.